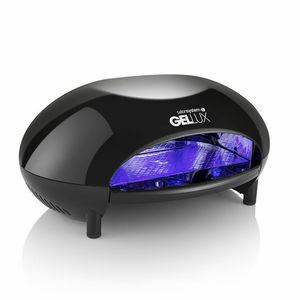 Ultimately fast curing lamp for Gellux gel polishes. The Salon System Gellux Express LED Lamp offers an incredibly fast and effective way to cure Gellux Gel Polishes—in as little as 10 seconds! Its ultra-fast and intense LED bulbs (21W) provide an ultimate cure, and the unit itself comes in a stylish, black gloss finish. Big enough to handle a 5 finger cure, the Gellux Express LED Lamp has easy-to-use pre-set controls (10, 30 and 60 seconds). Bulb life is estimated at approximately 30,000 hours and the unit comes with an automatic motion sensor which ensures instant light activation and accurate timing. It also features a removable raised base for pedicures. £131.58 (inc. VAT) Why no VAT? We're a trade wholesaler and quote our prices without VAT to help our VAT-registered customers understand the true cost of a purchase.